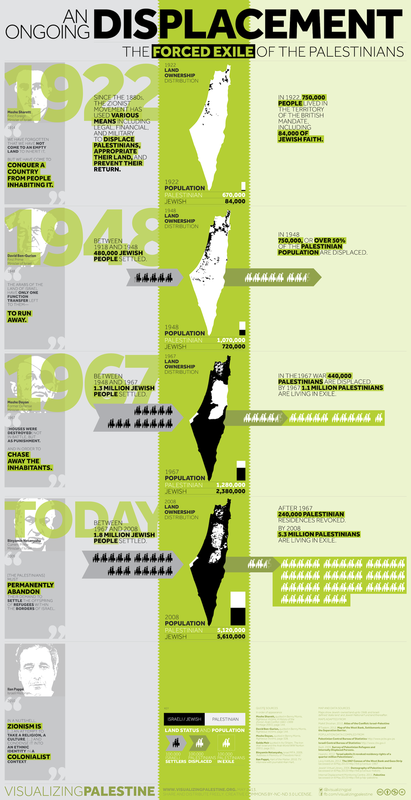 The Unending Nakba – 65 Years is Enough! Today marks 65 years since the beginning of the ethnic cleansing of Palestine in which over 750,000 of its Palestinian inhabitants were driven from their homes and land, Palestinians whose familes had lived there for generation after generation. The Nakba or Catastrophe continues with the ongoing Israeli military occupation of East Jerusalem and the West Bank and the illegal siege of Gaza that continues to strangle its people. This graphic from Visualizing Palestine offers a visual representation of displacement, dislocation and loss of homeland through the forced exile of Palestinians. As this Al Jazeera documentary shows, the plan to cleanse the land of its Arab inhabitants goes back at least to a conquering and war hungry Napolean but took shape through the Zionist project with British colonial support involving Jewish militias and terror groups. The massacre at Deir Yassen is the most well known symptom of this violent history but the loss of Palestinian culture and heritage through the organized robbery of Palestinian books is violence of another form. As this excellent documentary from Al Jazeera shows, the fact that these books remain inside Israel in a library that most Palestinians cannot visit is symbolic of the ongoing Nakba. A commemoration of a tragic event that is still unwinding in military occupation and apartheid must be fuled by tears, but there are many sources of strength and hope. It is to the struggle of some of the most oppressed people on the planet we share that we must turn our attention also. As sweat next to tears, the cries of resistance are as deep as the wounds. Here is a collection of poems read aloud in his own voice by Palestine’s late national poet Mahmoud Darwish to the music of Le Trio Joubran. The Nakba must end. Palestinians will be free. Until then, those of us with the freedom to raise our voices against injustice must.